Rhubarb Roses for Mother's Day! Rhubarb is in season just in time for Mother's Day! Ever since I was little, I've loved rhubarb. Mostly in the form of rhubarb crumble, an English dish my grandmother introduced me to that is equally tart, sweet, and creamy (thanks to the custard that gets poured on top!). 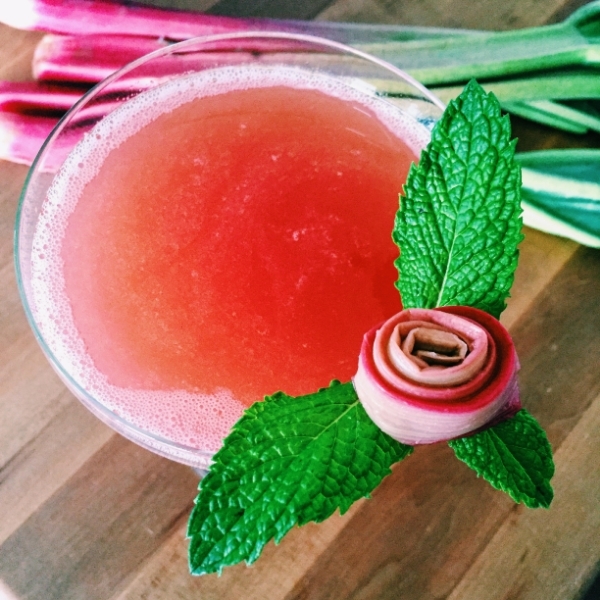 This year I wanted to make rhubarb cocktails fit for a Queen, and of course that means garnishing them with roses made from rhubarb (full recipe at the bottom)! Aren't these roses sweet? First you need to slice some rhubarb about 1/8 - 1/4 inch thick. I do this by using a knife, but you can also use a vegetable peeler. Make sure to get some ruby red in every slice, and don't be afraid to make some strips purely green (they dye a pale pink/orange as you sauté them!). Make sure you cut them to about the thickness shown below. Too thick and they become very clunky. Too thin and they fall apart as you roll them into roses! Heat up a large fry pan with 1/2 cup water and 1/2 cup sugar and bring it to a simmer. Add the rhubarb and poach for about 45 seconds. You want the rhubarb to soften but not break down. It should be easy to roll. Remove from heat and let cool for a few minutes on a paper towel. Make sure your strips of rhubarb are laid out straight, with the rosiest side facing down, and start gently rolling into a rose from the palest, most colourless side. You want to make sure that the majority of your colour ends up on the outside! As you roll, periodically pause and use your pinky to push the middle of the flower up. You don't want the middle of your flower to sink! Return your roses to the paper towel and let them cool completely. Grab a sprig of mint and place the rose on top. You may have to remove the smaller leaves on top of your mint so your rose lays flush on the larger leaves. In order to make the rose and leaves stay on the edge of your glass, you will need to take a sharp knife, hold the rose upsidedown (gently), and make one or two deep slits on either side of the rose (mine only needed one). You can then wiggle the rose on the edge of the glass with the mint leaves tucked underneath. If you have trouble finagling the mint leaves, you can always tuck two leaves under the rose once you affix it to the side of your glass (see below). The cocktail below has the rose facing inwards toward the drinker, rather than straight up, which allows Mom to gaze lovingly at your rose every time she takes a sip! Pour all ingredients into a shaker with ice. Shake vigorously. Strain into glasses and serve ice cold. Rhubarb Coriander simple syrup is easy to make! Just add 1/2 cup sugar and 1/2 cup water to a pot and add 2 stalks of rhubarb and two teaspoons of stalk of coriander. Bring to a boil then reduce to a simmer for 10 minutes. Strain and let cool. You can keep this drink completely local and omit the coriander if you wish, but I think the coriander adds a brightness and warmth to the drink!